On Tuesday, April 2, I flew to Washington, D.C., for the premier of Steve Forbes’s and Elizabeth Ames’s documentary, “In Money We Trust?” in the nation’s capital. The event occurred at the Trump International Hotel. I’m one of several monetary experts interviewed in the film, along with Alan Greenspan, Paul Volkerand Steve Forbes himself. You can watch the trailer or the entire 54-minute doc by going to www.inmoneywetrust.org. My comments on the origin of the Fed can be found starting around minute 17 in the film. Over 200 people attended the event. Other luminaries in attendance at the premier included Steve Moore, President Trump’s nominee to fill an opening on the Federal Reserve Board. Afterwards, Steve Moore’s organization, the Committee to Unleash the Economy, hosted a private dinner. Larry Kudlow and his wife were the guests of honor. He was very supportive of Steve Moore, and said President Trump was not backing down in nominating Moore, despite controversy over his nomination (read last week’s Skousen CAFÉ). 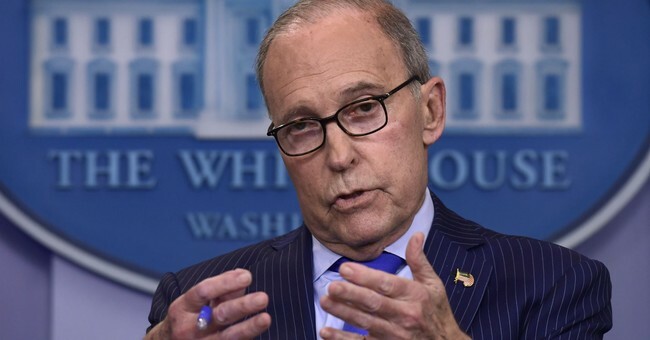 Most of the questions Kudlow fielded from friends were about foreign trade policy and immigration. Larry is heavily involved in the upcoming trade deal with China, and he has to manage to control the protectionist anti-China faction in the administration (such as Director of Trade Peter Navarro and Commerce Secretary Wilbur Ross). Larry also is dealing with the potential closing of the border between Mexico in the United States in response to the growing immigration crisis. He reported meeting with leaders of the U.S. Chamber of Commerce and their concern that the border shutdown could severely damage the economy and jeopardize billions of dollars in trade between the two countries. Larry said it was a serious challenge and the administration is trying to work around the problem while seeking to solve the immigration crisis. Larry wanted to know my views about the Trump economy — is it still doing well despite the trade and immigration issues? He is a big fan of my gross output (GO) statistic and asked me about the latest data. I told him that GO is the best measure of economic activity. Unlike gross domestic product (GDP), GO includes the value of the supply chain and business-to-business (B2B) spending. Moore led a lengthy discussion at dinner about monetary policy and the Fed. In the documentary, Steve Forbes favors a return to a gold standard whereby the Fed seeks a policy that stabilizes the price of gold over the long term. I noted that in the past year or so, the price of gold indeed has stabilized at around $1,300 an ounce. I said this is an indication that the Fed policy has been working, even though the U.S. central bank has raised interest rates. And while gold has been relatively stable, stock prices continue to move higher. What’s not to like? I also told the group that we must look not only at the price of money (interest rates) but the supply of money. According to the Fed, the money supply (M2) growth rate has been pretty steady and not excessive. All good news for investors.